STEROPONY should be well known to many anime fans as the artists behind several notable anime themes. Their debut single “Hitohira No Hanabira” was the 17th ending theme for the famous anime series “BLEACH”; released on November 5, 2008 and ranked #25 on the Oricon Weekly Charts. 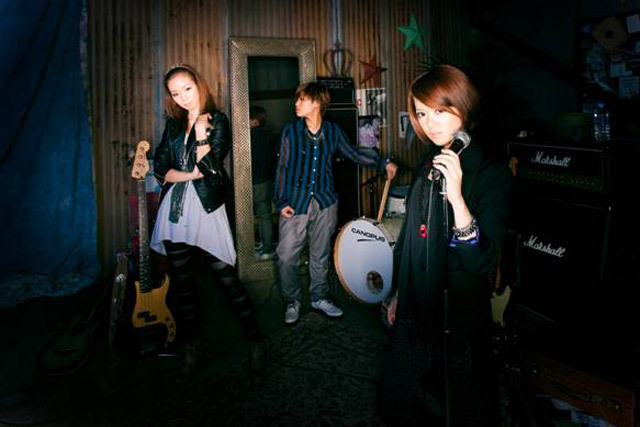 Their 2nd single “Namida No Muko” was the second opening theme for the second season of the Sunrise series “Mobile Suit Gundam 00”; and achieved #2 in the Oricon charts. STEREOPONY has toured internationally and experienced great success in the Oricon charts. In March 2009, the girls performed in SXSW 2009, and received a thunderous ovation. Their 3rd single “I do it” is a collaboration with fellow Sony Music Entertainment Japan singer YUI, was released on April 22, 2009. Their debut studio album “A hydrangea blooms” was released on June 17, 2009 and ranked #7 on the Oricon weekly charts. STEROPONY’s 5th single “TSUKIAKARI NO MICHISHIRUBE”, also released with a tie-in with the second season of hit anime series “Darker than Black” which ranked #8 on Oricon. After releasing 2 singles, in June 2010, the girls released their much anticipated 2nd studio album “OVER THE BORDER”. “Chiisana Mahou”, the opening theme of anime series “Letter Bee REVERSE” was released on December 8th. STEREOPONY collaborated with the band Kariyushi58 to produce the single “Tatoeba Utaenakunattara” released on August 10, 2011. The band’s 10th single, “Arigatō”, was released on September 28, 2011. The music video for “Arigatō”, released on September 1, 2011, features film actor Abe Hiroshi; he is also on the cover of the version B release of the single.